Even before you are ready to buy or sell, you deserve to partner with only the best. With 22 years of real estate experience as a Broker/Sales Associate, I understand that clients need to choose their agent wisely. Buyers and sellers deserve a straight forward and experienced agent to rely on. I counsel my clients on market challenges and help them avoid the pitfalls. Clients trust me to guide them through preparation, staging, pricing, inspection issues and lender appraisals to a positive and successful closing. Born and raised locally - Berkeley Heights, Summit and Short Hills - along with volunteering in many organizations and on town boards, I am able to share the 'local flavor' with my buyer clients. I realize that my many top awards and designations only validates my successes; it is each individual client's need that inspires me, and more importantly, matters to them the most. I have built lasting relationships with my clients and have earned a stellar reputation with my colleagues. 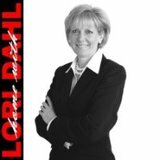 When referring a client or their family to a far-away destination, it is heartwarming to hear them request a "loridahl" clone.